In Lens the coal industry is the only thing possibly more important than RC Lens. The Blood and Gold football club had its stadium rebuilt ahead of the 1998 World Cup, so before Euro 2016 it only underwent a thorough renovation. 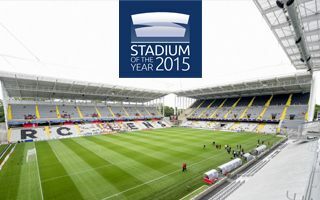 We’d say Stade Bollaert-Delelis retained its unique “English” charm, but the vote is up to you on whether you appreciate what’s been done. Ahead of this year’s Euro the stadium was ripped to bare concrete and had the roof structure revamped entirely. For the first time ever all fans are protected from the elements and the 72-meter masts stand out in the urban landscape, reinforcing the stadium’s landmark status. Also the stadium’s floor space was largely expanded to include new spectator amenities. And while the building retains its rough, industrial feel, it also became quite elegant. All facades were covered with white cladding, some of it made with translucent mesh. Simple geometric shapes make its outer form more abstract and give great illumination opportunities. As for seating, the capacity went down by roughly 3,000. The seating layout was improved, all seats changed and 40,000+ was too much for long-term demand either way. So this loss may not hurt fans much, but selected solour scheme drew negative attention. Some supporters would much prefer red and yellow seats to resemble the club colours. Building a new stadium in Lens would have cost approximately three times the price of what was spent on the recent redevelopment. But while it significantly improves the stadium, not everyone in Lens is happy about the standard achieved. Perhaps locals need to get more accustomed and the city should consider consulting fans on what to improve? If at all, any changes won’t come after the great test: Euro 2016!